(c) Ed Seykota 2003-2018 - Write for permission to reprint. We begin the meeting with 4 Tribe Members. We begin with drumming & check in. 3 members feel hot and express their wish to take the Hotseat. Hotseat 1 feels he gets hot more often in general & wants to work on that. He gets into his forms that include rubbing his hands and tapping his knees with his hands. At one point during the hotseat, we see him lean back on hotseat with immense sadness on his face & he begins to cry. He then rubs his arms & feels a white pulsing pain through his hands. PM checks for willingness, and hotseat does not wish to continue. We do the reintegration process & the hotseat ends. During checkout, we commend the hotseat for his commitment. Hotseat also feels that there is more sadness that he needs to work on. I recollect reading on FAQ's that if the receivers share his k-nots around sadness, it becomes harder to receive the Hotseat. Hotseat 2 wishes to work on his anxiety & he has a contraction in his chest. As he begins doing his forms, he joins his hand in a prayer like position & pounds them. He feels a red light contraction in his chest. During the process, he also feels a sense of expansion & lots of blue light. He makes a sad face with deep breathing that quickly turns into an angry expression. We test for willingness & hotseat elects to end the process. The process ends & we check out. Hotseat 3 begins the process & quickly gets into his forms. He feels dejected. He feels it is ok to not be very hard on himself. PM tests for willingness & HS is unwilling. We check out. During check out, I & PM feel that there is more to the feeling of dejection that we need to work on. We conduct a final check out & the meeting ends. Thank you for sharing your process and for documenting your Tribe meeting. You might consider taking you feelings about <unwilling> to Tribe as an entry point. A few of the veteran Tribe guys here in the NYC area express an interest in holding a few sessions - primarily working on snapshots, the hardball process and getting on the hot seat. I express an interest in working on a snapshot that bubbles inside me with more and more clarity over the previous few weeks. I practice visualizing it each morning and night to get it as clear as possible before Tribe meetings start. At Tribe, with the the help of the guys, I intend on clarifying this snapshot even further and actualizing it. Snapshot: I provide for my family. Description: In my home office, with lots of light and open space, I hold my wife and child (child not pictured). On my desk to the left, I have two monitors where I conduct my trading work. On the right, I have an Apple computer where I write and work on marketing. My chair has a high back and reclines. To the left of my desk in the corner, I have a coat rack. To the right, I have a flatscreen mounted on the wall where I can pull up my daily PnL, open positions and risk. Straight ahead, across the room, I have a big bookcase that shelve all of the books I read as well as pictures of my family and friends. It's morning time, but the sun is fully up. I have the windows open so the room smells of fresh air and fresh cut grass. I can hear the birds chirping too. In the center of the room, with one arm, I hold my wife and with the other I hold my child (for some reason I picture a girl). Confidence and love create a buzz all over my body, especially my chest and head. I have a clear mind - no regrets or any racing thoughts; just calmness and contentment. I have one thought: "I love my life. I have both my family who I love so much and a successful fund working for great investors." After I say this to myself, the tip of my nose tingles and my eyes well up. I feel both energetic and grounded. Energy comes from satisfaction that I have what I want - to provide for my family by making money for people with whom I have great rapport. I feel light on my feet, strong in my back; I stand tall with good posture and feel the softness of my wife's forehead as I give her a kiss; also, I see and hear my child (again, I picture a girl) giggling as she has fun in her own little world. Thank you for sharing your process and your snapshot: "I provide for my family." I notice in your description, you provide hugs and kisses and financial support and that your daughter giggles in her own little world. You might consider taking your feelings about <deeply intimate connection> and <lifetime commitment> to Tribe as entry points. Thanks for your response Ed. Is there any guide which I can reference to in order to define my own system? My doubts are mainly concerning entry and exit triggers and amount per position. I'd be grateful for your help. You can learn about systems and design one that fits your particular situation through back testing. Ultimately, you can't find the "best" system, any more than you can find the "best" wife. I both cases, a lot initially depends on your own preferences - and ultimately on your own ability to maintain a prosperous relationship. I'm a new trader as trend follower, and i just go on your webdise. I"d like understand, what is TTP ? Some people talk about testing trend following strategie (what i'm looking for ) and others loosing weight. Thank you for asking about TTP. You can find out about TTP theory by reading through this website. You can find out about in practice by taking your feelings about <correct spelling and punctuation> to Tribe as an entry point. You might like to know that Goldman Sachs publishes a buy-commodities recommendation as of April 16. Thank you for passing this news along to me. The green circle marks the buy-commodities recommendation. "Times series work to determine the trends for each market has been coupled with the momentum revolution, so that cross-sectional work of ranking markets is now a core part of trend-following diversification." I understand the words: “Time series work to determine the trends”. I assume “coupled” means combining two or more techniques for entry, exit, or bet sizing purposes. I am wondering about the words: “cross-sectional work of ranking markets” and “momentum”. Also curious if you know when the “momentum revolution” started and its current state? The title of this article may represent the history of Renaissance Technology or Bridgewater Associates, both of which were largely trend followers in the mid 1980’s. Thank you for sending me the passage and the link to the entire article. I do not know how to interpret the passage. You might consider asking the author to rewrite his article in SVO-p (Subject, Verb Object - present tense). You might consider taking your feelings about <encouraging clear writing and thinking> to Tribe as entry points. 1. Is the TT website active? 2. Are there still organized group meetings? 3. Is there an online Trading Tribe group one can participate in? Thank you for inquiring about the Trading Tribe. 1. The site still seems active, as of today. 2. Tribe meetings still occur - with varying degrees of organization. 3. FAQ (this site, this page, this moment) represents the Trading Tribe version of an on-line group. I am interested in learning trend trading from you. Can you please call me. You can send me questions via FAQ, below, and receive replies for free. 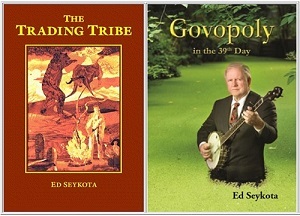 For terms for private consulting, see my site at FAQ/Ground Rules. I find the process of dieting very easy at this point in time. I no longer think about food and food no longer is waiting in the wings as "medicine" or an activity. Disciple and control are replaced with chemical balance. The Zone Diet creates the right chemistry within my body whereby cravings are non-existent. I follow the rules and eat five times per day with the prescribed balanced dosage of food my body requires. I find the process very similar to my trading. I download my data (shop for food and check for freshness) - run the data through my programs (prepare a balanced meal as per my "program") - enter my orders (eat!). I don't look at the market during the day - and I don't look at food anymore, unless it's time to "run the program" again. Similar to trend following, the diet process is a long term event. 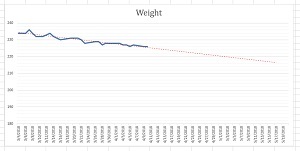 My graphed weight isn't a perfectly straight line nor is my equity curve. There are bumps along the path. My intention is for them to go in opposite directions. I wonder if you might keep posting your chart and then send it to me once per month - along with descriptions of any strong feelings that come up during the process. I trade Crude, Gold, and Copper Futures. I'd like to get better (work on my own issues with like minded folks). Does your Trading Tribe still meet? Thank you for raising this issue - and for asking about the Austin Tribe. I can feel another Austin Tribe Series coming on. Going through a divorce, and lots of feelings are causing me to lose focus on moving forward. I think main thing is uncertainty. I agreed on a settlement figure and paid all future child and alimony, which changes the dynamics of my bankroll drastically. Thank you for sharing your process. You might consider taking your feelings about <setting boundaries> to Tribe as an entry point. You might consider surrounding yourself with friends who can encourage you to express your your feelings and re-establish clear thinking. How do I manage my fear in the market....I am always being beating by the market and running at a loss due to fear...How do I manage my fear in the market? In TTP we do not aim to manage our emotions; we aim to celebrate them and to align with their positive intentions. One intention of fear has to do with risk control. You might consider taking your feelings about <fear> to Tribe as an entry point. Perhaps your fear has some important information to share with you. We begin with a drumming session with 5 members present and proceed to check in. During check in, 2 members, (I and the TM to my left) feel hot. I work on my issue of not knowing where life is going, arguments with my father and "girlfriend". I take the hotseat & begin describing my problem, PM quickly notices my right foot stomping. As I get into the from, I start stomping my foot. As I proceed further, my forms change. I start stomping both my feet and my hands move up & down as if milking a cow. I recollect an incident of a time when I was 6/7 years old & get stung by a bee on my left hand. I feel the pain but also a sense of sadness because the bee dies. As I develop the forms, I start remember feeling jealous when I see a family friend having a video game that I want. I feel sad because I have to beg, borrow, steal and mostly justify wanting video games and then be denied. I feel being a small pin/needle in the left side of my chest. While not prickly, it is just a presence, with some fuzziness around it. As I write this, I realise this leads me to a painful/cynical belief of "I never get what I want regardless of what I do & basically just beg, beg, try to convince and then be denied. When I finally get a video game, it fails to run on my PC and I feel disappointed, reinforcing my cynicism. As I proceed further, I start smashing my chest ala Tarzan, feeling happy. As I proceed further, I feel small and shoulders sort of compress in. The Process Manager then asks me whether I am willing to proceed further, for which I am unwilling and the process ends. During the process, I see a lot of images, but view them from afar, as if in a train quickly passing by. During checkout, all members praise me, for which for the commitment, for which I feel happy & proud, along with a tinge of suspicion and insecurity. One member remarks that I say a certain feeling is stupid and tells me that ALL feelings have a positive intention, that they are all allies and that they have somatic properties, everything from a dry mouth to a pain the shoulder. HS2 remarks that I have lots of feelings that are unresolved and are now finding an outlet. We remember the forms re-integration and I work through that process. HS2 states that he feels lost and unsure of what to do next. His boss may quit and he finds it difficult to give his 100% to work. His family remarks that he seems lost or bored. He takes the hotseat and develops his forms. He stamps his foot and then feels a backache. He feels sunshine, pressure on his head and warmth on his face. He sees an image of his wife walk by but is unable to process further. PM tests for willingness and HS2 is unwilling to proceed. We begin the forms re-integration process and HS2 begins the process. He goes from warm to striking hot in 2 seconds flat and remembers how he stops taking money from home around the 8th or 9th Grade, instead doing odd jobs. He collects Trading Cards and sells them. For a special card, he remembers making 200% profit, with a wide smile that is infectious. The process ends. During checkout, I mention that I too feel some of his forms, especially the hand waving and even the pressure on the head and that his smile has an infectious happiness to it. I also mention how I am reluctant to encourage him for fear of pulling him out of his process or doing it incorrectly. Another TM mentions that how making profits is the goal of trading and how it relates to his memory. Another TM also praises how he sees progress & commitment of the HS and calls it one of HS's best process. PM also praises HS's commitment. PM mentions that the fleeting image HS had of his wife could be something he may want to explore further, like a feeling trying to get out. PM also tells another TM that how relating card trading to trading to profits may plant ideas in the HS, not all of which may be beneficial. PM also mentions how he will miss not being able to take the HS for some time due to surgery. We check out & Tribe Meeting ends. As I write this, I feel waves of energy going through my body, especially my arms along with pressure on my head, as if someone is kneading my brain along with a tightness on my cheeks, nose and forehead. As I focus on my head, I occasionally feel energy going down my spine. I wonder (and feel frustrated) what these sensations are trying to tell me. I commend you for your testing for willingness - and for stopping the process upon discovering unwillingness. I trade Crude, S&P, Gold, Copper, from a [Firm Name] Platform. because it would, for example, pass the buy stop of a Crude Oil Contract, and while you knew it must have executed, it never showed to have executed on the platform, and the platform, while continuing to receive real time data, did not allow me to go flat the contract I knew must have executed, because the platform for 24 minutes, did not show the execution to have taken place. Thus leaving me "at the mercy of my enemies" (or friends depending on the perspective) for periods of time. Q1: Does this happen on other platforms such that moving my account would just yield the same song but a different verse? Thank you for sharing your process and workings of your trading platform. I do not know enough about your platform to comment. I do know, from personal experience, that malfunctions occur. See directly below. on both eseykota & seykota sites grains are showing on the stock page & from 3/14.